Made by Henri Selmer & Co in England, 1950. The Clavioline was an electronic keyboard instrument that was invented by Constant Martin in France in 1947. By the 1950s its manufacture had been licensed to various companies in France, England, Germany and the USA. It offered musicians a different sound to other instruments available at the time, prior to the commercial introduction of the synthesizer in the late 1960s. Electronic keyboard, 'Clavioline', metal / plastic, Henri Selmer & Co Ltd, London, England, 1950-1965. 'Clavioline' electronic musical keyboard instrument (Concert model) consisting of keyboard, amplifier, leads, keyboard stand and brochure. 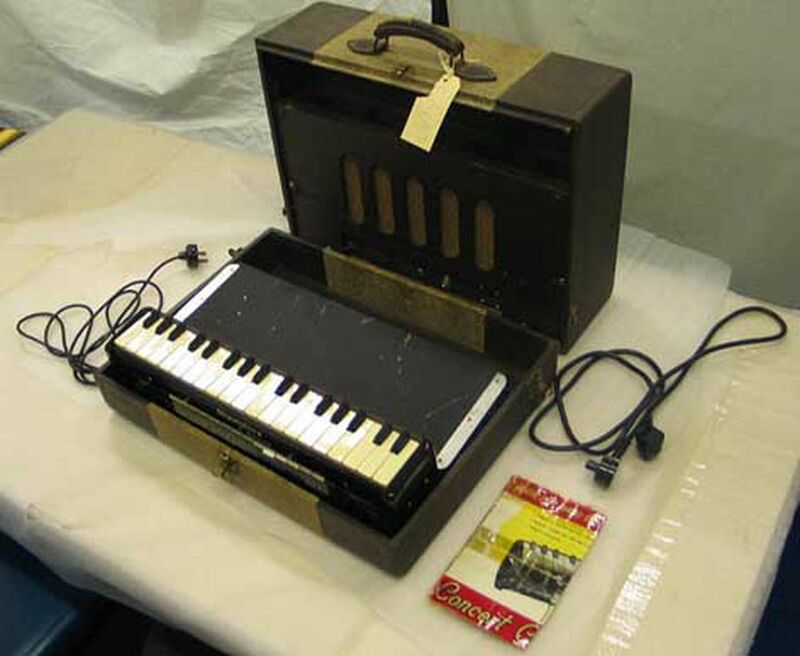 Keyboard, leads and amplifier housed in one unit similar to a hard suitcase with leather carry handle and divides in two to form amplifier unit and storage section for keyboard and leads. Finished in two tone leatherette of dark brown at ends and light tweed in central section. Amplifier contains speaker behind brown mesh and grill. Below this is the on/off power switch and light, a socket for connecting keyboard to amp and a [fuse]. Mains lead is already attached. The keyboard unit is finished in a black metal housing with plastic black and white piano keys along the top and a series of black and white rocker switches along the front. The order of switches from left to right is: 4 black (Vibrato III, Vibrato II, Vibrato I, Amplitude +); 14 white (numbered 1 to 9 then 0, B, V, P, F); 4 black (Sub I P, Sub II P, Sub II F, Sub I F). Large flat area at top behind keyboard enables it to be attached beneath a piano keyboard. There is a knee operated volume lever beneath the keyboard unit. The collapsible metal stand consists of two sections; a black rectangular base with chromed tubular metal upright supports for upper section. The upper section has a black rectangular stand for the keyboard with two rods beneath which fit into the lower section. The height of the stand can be adjusted. The two sided colour brochure which features pictures of the instrument gives general information of what the Clavioline does, information about its power output and a list of suggested settings to produce the sounds of particular instruments. The brochure has been repaired with adhesive plastic and tape. Metal maker's plate at rear reads; "Clavioline"/ Licence Constant Martin / Type C No:- C/9727/ Patent No:- 643846 & 653340 / Patents Pending / Made In England/Henri Selmer & Co. Ltd., / 114-116, Charing Cross Road, London, W.C.2." Produced in England by Henri Selmer & Co Ltd under licence from Constant Martin of France. Claviolines were also produced under licence in France by the Societe Le Clavioline, in the USA by Gibson and in Germany by Jorgensen Electronic. Although invented by Martin in 1947 it appears to have been put into production from the 1950s until possibly the mid 1960s. It is uncertain how many were produced. The Clavioline was originally invented in 1947 in France by Constant Martin. This instrument was used by during the 1960s and 1970s used in small music groups that played at dance halls, receptions etc.